Get Admission in Pak Army armed forces nursing service because admission are now opened for year 2019. Pak army AFNS admissions 2019 now opens for nursing service in armed forces. 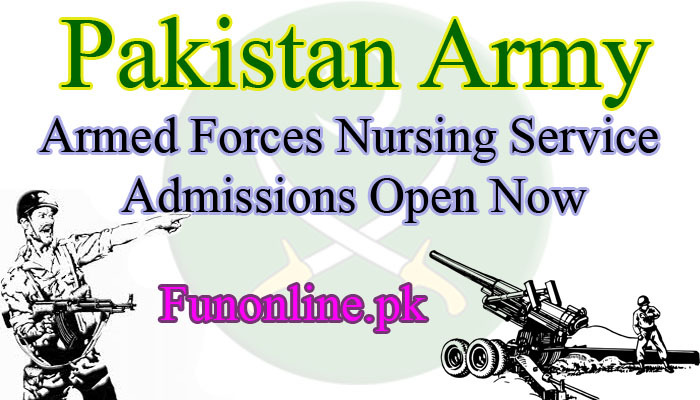 web study is right place where you can get all the latest information about Pak Army nursing admissions 2019, pak army armed forces nursing service admissions 2019, pak army AFNS admissions 2019, AFNS admissions 2019, AFNS admission fee structure and fee schedule 2019, Pak army AFNS test dates, AFNS admissions roll no slip download, AFNS admissions form download, pak Army AFNS admissions Apply Online, AFNS online registration form and all other information needed. AFNS college university contact numbers and pak army test centers contact numbers. Candidates can also apply on HOPE certificate if any candidate’s second year result is not announced but they have to submit their second year result sheet after their result will be announced. Candidate should registered in Pakistan Nursing council (PNC). Candidates having experience in ICU, OT, CCU will be given preference. Candidate should be citizen of Azad Jammu Kashmir, gilgit Baltistan Pakistan. If any candidate have dual nationality then they should Unnationality their other nationality. Candiates can apply online for this admission or by walking through Army selection and recruitment centers (AS & RC’s). Whole process is given below. Go to Pak army website that is www.joinpakarmy.gov.pk and get yourself registred. You will be informed via internet for date date and time, for that candidate should have their own Email Address. Candidates will get computerized Roll no slip in which roll no, test center, time and date will be written. Candidate must bring following documents in para6 and have to pay prospectus fee at examination day. Note that candidate should know how to use computer. Candidates can get Registration number and Roll no at army selection and recruitment centers after paying Registration fee. First Medical Test will be held at army selection and recruitment centers. Candidates who will pass the test will call for interview at Karachi, Multan, Lahore, Rawalpindi and Peshawar by GHQ selection board. Every Candidate will be called separately. Every candidate will be called for medical test and training via internet on website or Email Address. Final Selection will be in General Head Quarters. Four weeks Basic army training at following institutes. After getting Successful training candidates will get Commission in Leftinant rank. Candidate should bring following documents with them at AS&RCs. Original documents, marksheets with educational certificates and their attested Copies. Government Employees should bring NOC from their head of department. Rs. 100 crossed post order by name of Director General personal administration DGPA GHQ Rawalpindi. Note:Old/expired CNIC will not be acceptable. Finaly selected candidates have to signature a Bond that they will do army service for 10 years after getting trained. For Further Detail Contact our Official Website www.joinpakanny.gov.pk or Rawalpindi, Lahore, Karachi, Peshawar Quetta, Gilgat, Hyderabad, Multan, Muzzafargarh and Faisalabad nearest Army Selection and Recruitment Centers. For Email : webmaster@joinpakarmy.gov.pk. You can also get more information by contacting on below Numbers.